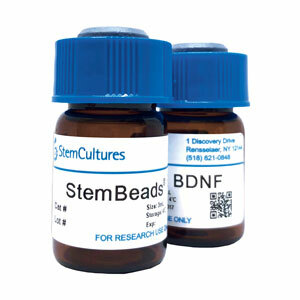 StemBeads® BDNF is a patented growth factor supplement that offers a novel way to culture cells with Brain Derived Neurotrophic Factor more efficiently, with greater control and fewer medium changes. StemBeads® BDNF are microparticles composed of an FDA approved, biodegradable polymer that is loaded with recombinant human Brain Derived Neurotrophic Factor. Under the microscope, StemBeads® will appear as small dark spheres that do not harm the cells, and with time, will break down while releasing the encapsulated protein at a controlled rate. Controlled delivery and stable levels of BDNF improve cell cultures while saving researchers valuable time and resources. StemCultures' pricing structure is for US-based customers only. International customers, please contact your regional distributor or contact support@stemcultures.com for further information.